CH Control™ is our uniquely formulated product. It combines vitamin E, niacin, magnesium, manganese, chromium (polynicotinate), alpha lipoic acid, bromelain, L-carnitine, lecithin, garlic, policosanol and taurine into one great product. 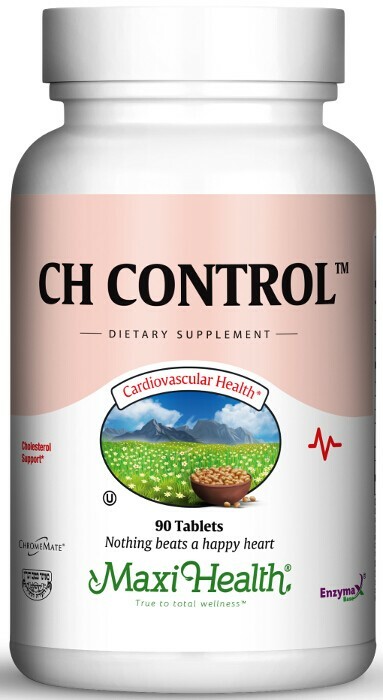 Try CH Control™ and see what it can do for you! Take three (3) tablets daily with meals, or as directed. Other Ingredients: Microcrystalline cellulose, dicalcium phosphate, stearic acid, magnesium stearate, croscarmellose sodium, Ezymax® (calcium carbonate, bromelain, papain, lipase, amylase, protease silica) and aqueous film coating (purified water hydroxypropyl methylcellulose, vegetable glycerin). ChromeMate®, a patented, biologically active oxygen-coordinated niacin-bound chromium complex, is a registered trademark of InterHealth Nutritionals, inc.
NewGar® is a registered trademark of Nature *4*Science. Traacs® is a registered trade mark of Albion Laboratories, Inc. I was diagnosed with high cholesterol. As a young mother I was not ready to take on a medication regiment if it was possible to avoid it. I took Maxi Omega 3 and CH Control, and Red Yeast Rice. After several weeks my cholesterol went back to normal.